Why Believe The Book of Yahweh or Your Bible? Anyone who reads their Bible or The Book of Yahweh, and actually pays attention to what it says, can see that the Roman Catholic Church and all of her daughters—the other 4,198 God worshipping religions in this generation—follow and belong to Satan the devil, not Yahweh, the Creator of mankind. The Bible authorities agree that the Being Who created the heavens, the earth, and mankind is named Yahweh. The Roman Catholic Church/Vatican forbade the versions of The Book of Yahweh to be printed with the Names Yahweh, the Heavenly Father and Creator, and Yahshua, the Savior. When deceitful rabboni men, known as Roman Catholics today, allowed The Book of Yahweh—the Writings of Yahweh’s Prophets and Yahshua’s Disciples, the inspired Work of Yahweh—to be translated from the Hebrew language to English, they passed laws against printing or even speaking the Names Yahweh and Yahshua. Yet, the Names of Yahweh and Yahshua were spoken and written by Yahweh’s Prophets and Yahshua’s Disciples. Reading from The Book of Yahweh, we find the Name Yahweh. Reading from the King James Version, we find that Yahweh’s Name has been removed, and replaced with the Lord. Now, read the famous 23rd Psalm, which is constantly used in song and speech in the houses of the Gods. Again, notice that Yahweh’s Name has been removed in the King James Version. 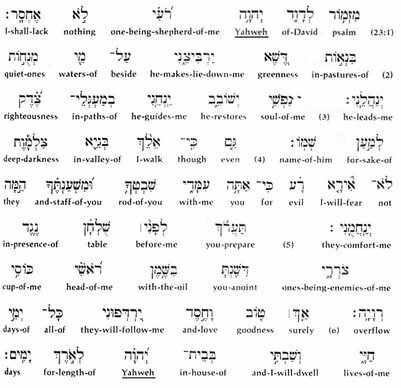 Now read these verses from The New International Version Interlinear Hebrew-English Old Testament by John Kohlenberger III. You read Hebrew from right to left ß. You have probably seen the word “Lord” from childhood and believed it was a sacred title or name, right? You thought this, even though your Bible says that Satan, that old serpent called the devil, has the whole world deceived. The only Book that offers a Plan for mankind and gives a reason for mankind’s creation is The Book of Yahweh. This Plan can even be found in the versions of The Book of Yahweh, such as the King James Version. It was changed to deceive mankind into following another way and prevent him from obtaining the goal Yahweh set for him. 4 In this Plan is Life, and that Life is the Light to mankind. Keep in mind that Yahshua Messiah said only fools will not believe the Words of Yahweh as they were written by Yahweh’s Prophets and Yahshua’s Disciples. What is this Righteousness that is required for you to receive Eternal Life? 17 And he said unto him, Why callest thou me good? [there is] none good but one, [that is,] God: but if thou wilt enter into life, keep the commandments. This same thing was said by the Savior in Mattithyah Chapter 7. Don’t just read the Words of the Savior, Yahshua Messiah, study them. It means your Eternal Life or eternal death. 12 Therefore, all things you want men to do to you, do the same to them, for this is the teaching of the Law and the Prophets. There are 4,199 religions in the world in this generation, and every one of them teaches contrary to Yahshua’s Words. Yahshua’s Words show you how to receive the gift of Life or how to bring death upon yourself. The Book of Yahweh and your Bible say that the religions teach the ways of death. Read Mattithyah 7:17-18 again and notice the word “evil” and the phrase “tree of evil” in the lesson the Savior is teaching. Those are simple instructions…do what Yahweh, Who formed you, says and Yahweh will give you Eternal Life. Satan and all of her preachers of the 4,199 religions teach the same thing that Satan taught to Eve, which deceived her into practicing sin. Notice in verse 5, “evil like the Gods”. Revelation 12:9 shows that Satan still has the 4,199 war-raging religions deceived and cut off from Life. Satan and the Gods are shown to be adversaries of Yahweh and His Plan. Yahweh’s Plan is to give mankind authority over the Gods and all creation. Those of mankind who choose to practice Yahweh’s Righteousness will be placed over all; that is, everything except Yahweh Himself. Therefore, the Gods and Satan would like to prevent that Plan for mankind from taking place. Your Law is a lamp to our feet, and a Light to our path. Did you notice that you belong to Satan when you practice sin? Sin is the breaking of Yahweh’s Laws. 4,199 religions teach the world to practice sin. They tell the people the same lie that Satan taught Eve in the beginning. Satan and her Gods teach the war-raging nations to keep sinning…surely you won’t die, they say. The Savior says you will be burned if you allow them to deceive you. Yahshua’s Disciples said the same. Your Bible is not lying. Your Bible is telling you the way to Salvation, and even Protection from the plagues that are coming. 16 And what agreement does The House of Yahweh have with Dods (elohim)? For we are the House of the living Father. As Yahweh has said: I will dwell in them and walk among them. I will be their Father, and they will be My people. If you follow Satan, her Gods, or her religions, you will surely perish. If you repent of sin and convert to practicing Yahweh’s Righteousness, you will not perish. Did you notice that your sins are never blotted out unless, and until, you repent of practicing sin and convert to practicing Yahweh’s Righteousness? I remind you again: the Inspired Scriptures are not lying, but the religions belonging to Satan are. You can repent and convert, and then your sins will be forgiven. But if the wicked will turn from all his sins that he has committed, and keep all My Statutes, and do that which is Lawful and Righteous, then he will surely live; he will not die. Notice, you will only be rewarded with Eternal Life if you keep Yahweh’s Laws. The warning is going out now to all the world. Verse 16: The House of Yahweh? Yahweh’s House and Eternal Life were cut off from mankind because they chose sin. However, in the Last Days, which is the generation of the nuclear bombs that will darken the sun, Yahweh says He will establish His House. The Message of Yahweh’s Kingdom is going to all nations, as I write. You can miss out on the nuclear burning if you heed the warning and act now. Verse 2 – In the Last Days. In Mattithyah 24, Yahshua shows the Last Days to be the days of the nuclear bomb—that generation. The gathering is taking place now. Come and let us teach you to rejoice.